Thread: 2BA. 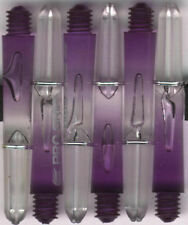 Convert your soft tip darts to play on any bristle dart board. 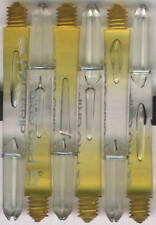 Steel Tip Darts Conversion Points. Therefore, it may appear that it is not moving, but that is probably not the case. Color: Silver with Diamond cuts. 20 Gram Soft Tip Darts. These 80% Tungsten darts have been created to provide a professional level dart at an entry level price point in enough shapes, weights and designs to suit any playing style. The Vapor-8 range features a wide variety of barrel shapes, weights and designs, with a distinctive Black and Red ringed grip each barrel. 18 Gram Soft Tip Darts. The barrel has been coated in a black Titanium Nitride coating for enhanced protection and a more durable finish. 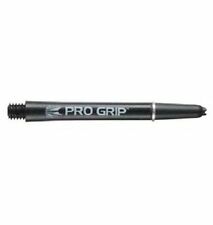 Complete with Pro Grip shaft and Rob Cross Pixel NO6 flights. Target Dart Shaft Extractor Tool – Black. Doing so is against U.S. and other laws. Target Adrian Lewis. 20 Gram Soft Tip Darts. 80% Tungsten. We try our best to fit you with the best products to enhance your indoor sporting experience. L : 50.0 mm. Soft Tip Darts. Phil Taylor. 80% Tungsten. We try our best to fit you with the best products to enhance your indoor sporting experience. Make Supersized Seem Small. Model#-200240. Target Wayne Mardle. Introducing the next generation of 90% Tungsten Wayne Mardle darts. 19 Gram Soft Tip Darts. 90% Tungsten. The Hawaii 501 Gen 2 feature Target’s unique dual pixel grip technology combined with radial grooves at the back of the barrel. This Takoma dart case is made with a strong EVA material to maintain rigidity and give protection to the darts and accessories inside. This case is solid black with a black pull around zipper. The darts and accessories shown in the case areNOT included. Stephen Bunting. Stephen Bunting, winner of the 2012 Winmau World Masters and many other titles, has joined Target's Stable. Target's new barrel design features 'Nano' grip technology - a fine and effective champions grip. 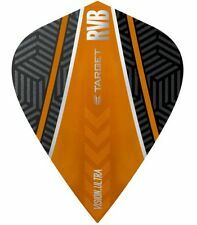 Phil in conjunction with Targets team of designers has collaborated to produce the finest range of darts ever seen. Soft Tip Darts. Phil Taylor. The Power 8-Zero Black is machined from an ultra-dense 80% Tungsten billet, the dart is then hand loaded into a Japanese CNC lathe for its machining process. 18 Gram Soft Tip Darts. We try our best to fit you with the best products to enhance your indoor sporting experience. 5 Sets - Target Vision Dart Flights - 100 Micron - No. 6 Standard - Black Union Jack Please see photos for more details. Good Luck and Shoot Well! You can't go wrong! LOT OF 3 SOFT TIP DART SETS TARGET RVB95 GEN 1 (x2) RVB80 BLACK (x1) Plus Case! They are manufactured using a new printing technique to provide stunning, vibrant colors. 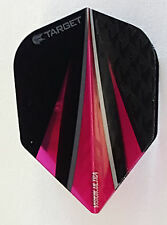 These flights are made of a 100 micron material to ensure their durability. Doing so is against U.S. and other laws. 18 Gram Soft Tip Darts. This new dart from Target features new Pixel grip technology. It combines both axial and radial precision milled cuts to produce a bi-directional grip form, never before seen on a dart. 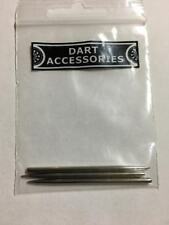 Adrian Lewis Jackpot Soft Tip Darts 18g 90% Tungsten 122340 w/ FREE Shipping. Condition is New. Shipped with USPS First Class Package. Target Vapor Darts. 23G Steel tip darts.Replaced original points with firepoints. Shipped with USPS First Class Package. Haruki Muramatsu. The Rising Sun 3.0 Japanese barrel as used by 2018 Dartslive Super Darts Champion - Haruki Muramatsu. Made to Haruki's exact specifications, these 95% tungsten darts are available in both steel and soft tip. This board also features quick-repair technology and an enhanced spider wire dividing system, providing more target scoring coverage and less bounce outs! NOTE: This is an exclusive product of Hey! QUALITY BUILD– This dartboard is able to fit into most dart cabinets and is made of an enhanced self-healing bristle construction, proving to be more durable than cork or wound paper boards when used with steel-tipped darts. Lighty used.Exellent condition. 1 original shaft is broken. Dave Chisnall. Soft Tip Darts. 80% Tungsten. We try our best to fit you with the best products to enhance your indoor sporting experience. Model#-101342.